As a component supplier, one of your major aims is to make your customers’ lives easier. Your customers are increasingly demanding and connected. You must adapt to their needs and expectations. Below are six things you can do to make your customers’ lives easier. Industrial purchasers are a simple click away from all the information they need to make a purchasing decision. The Internet allows your customers to get information when they want and make decisions in their own time; so, they expect you to simply sell them your components. Industrial buyers want you to help them solve their problems and achieve their objectives. How can you help them? Below are six things you can do to make your customers’ lives easier. This is the best way you can make your customers’ lives easier. Designers expect component suppliers to help them to optimize and accelerate their design studies. However, these are now mostly done in 3D. So, it is essential you put your catalog of components online and offer your 3D models in the right CAD formats. As we saw in the introduction, your customers want you to help them achieve their objectives and solve their problems. They have various questions and generally look for the answers on the Internet. To make your customers’ lives easier, you can publish high added-value content on your website that provides answers to the questions they ask every day. In this way, you can position yourself as an expert in your field and therefore attract more visitors to your website and catalog of components. This is also a good opportunity to generate more qualified leads. The Internet has made immediacy a natural expectation on the part of users. When we visit a website or use an online service, we want it to be fast, easy and user-friendly. The same goes for your customers. 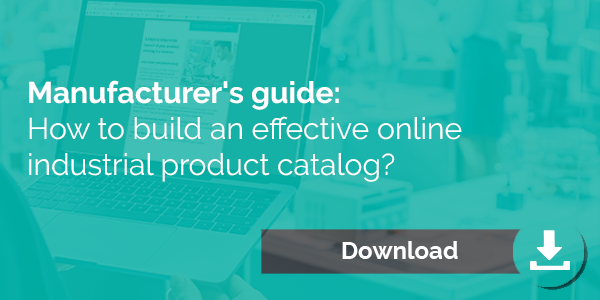 To make life easier for your customers, you must do all you can to optimize the experience users have on your website and when consulting your catalog of components. To achieve this, your website must upload quickly and be adapted to use on mobile devices. Navigation must be smooth and secure. As we have just seen, your customers want everything, right away. If they have a question about one of your components, they want an immediate answer. To meet this expectation and make life easier for your customers, it can be a good idea to provide real-time customer service online. To do this, you can use social networks or provide a chat function on your website. To make your customers’ lives easier, you need to send them the right content at the right time. Many component suppliers make the mistake of sending the same messages to both their customers and prospects. That doesn’t work anymore. Every day, industrial buyers receive nearly 20 sales emails. To get their attention and give them value, you must adapt the context of your messages to the needs and behavior of your contacts. So, it is essential to segment your contact databases and send your messages to qualified contacts. Buyers, design professionals and engineers want rapid access to your products and technical data wherever they may be. To make life easier for your customers, it can be a good idea to offer them access to your catalog of components via a mobile application. Your customers all have smartphones and other mobile devices. This gives you an opportunity to be more competitive and increase customer satisfaction.